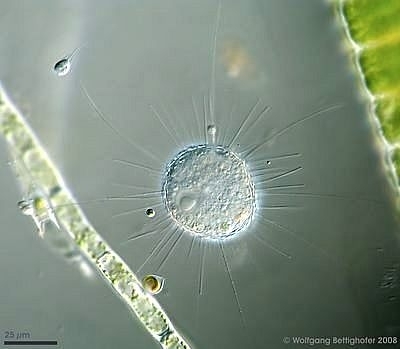 caption Acanthocystis penardi shows numerous siliceous spines and scales inserting and lying respectively upon the surface of the cell forming the periplast. The nucleus and several narrow axopodia are clearly visible, also a free swimming Salpingoeca species and a Chrysophyta called Chrysopyxis inaequalis fixed on a Tribonema filament with a mucilaginous string. Scale bar indicates 25 µm. Sample from sphagnum pond Dosenmoor near Neumuenster (Schleswig-Holstein, Germany). Images were taken using Zeiss Universal with Olympus C7070 CCD camera.